TunesKit iTunes DRM Media Converter for Mac empowers you to remove DRM and convert iTunes M4V rentals and purchases to DRM-free MP4, MOV, M4V, MPG, AVI, FLV, MP3, etc. with 5.1 audio tracks, subtitles preserved. Get tired of FairPlay DRM on iTunes movies and TV shows? Not any more! TunesKit for Mac is here to liberate you from iTunes DRM restrictions by stripping DRM control from both iTunes M4V rentals and purchases on Mac. Once the DRM lock is cracked, you are able to keep iTunes rentals forever and enjoy any iTunes videos, including 1080P HD movies and TV shows, on all kinds of mobile devices freely. TunesKit DRM M4V Converter for Mac brings a full set of advanced methods to fulfill all your needs to convert the DRM-protected iTunes M4V to common MP4, AVI, M4V, MOV, MPG, FLV, MPEG-1, MPEG-2, 3GP, 3G2, SWF, MP3, AAC, and other popular video and audio formats. It also allows you change output video settings as you wish, such as video codec, video bit rate, video size, as well as audio codec, audio channel, bit rate, etc. TunesKit for Mac serves as a DRM removal professional to make you get full control over your legally purchased iTunes movie items so that you can watch the iTunes videos on any device as you like. With a full range of preset profiles, you are able to easily convert iTunes M4V movies and TV shows to popular media players, smartphones, tablets, like iPhone 6S, iPhone 6, Apple TV, iPad, iPod, Samsung Galaxy, HTC One, PS4, Xbox 360, Google Nexus, Sony Xperia, and much more. 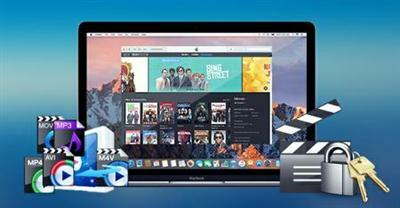 As one of the smartest DRM removal tool, TunesKit for Mac can not only convert DRM-protected iTunes M4V to unprotected MP4, M4V, AVI, FLV, MOV, MPG, or other media formats, but also retain original subtitles (closed caption), multilingual audios and 5.1 audio tracks when you set the output video format as HD lossless MP4 or M4V. By adopting the most advanced DRM decryption core, TunesKit for Mac is developed to be the world's fastest iTunes DRM media converter which works at 30X faster speed with a far more better performance that surpasses any other similar iTunes DRM media converter in the market. All-in-one iTunes DRM Removal, get rid of DRM restriction once and for all! Integrated with both DRM removal and M4V conversion features, TunesKit for Mac is your ultimate solution to bypass DRM FairPlay from iTunes movies and TV shows on (Mac OSX) with original video quality, 5.1 Dolby audio tracks, and multilingual subtitles retained. TunesKit for Mac is set to be handy with user-friendly interface so that anyone can be the master of DRM removal. Besides, the batch conversion on TunesKit makes it possible to get hundreds of iTunes M4V movies converted in seconds. Requirements: (Mac OSX) 10.11 EI Capitan, 10.10 Yosemite, 10.9, 10.8 & the latest iTunes. TunesKit 3.0.2 Multilingual (Mac OSX) download links are externally hosted on Extabit, Rapidshare, Rapidgator, Netload, Uploaded and TunesKit 3.0.2 Multilingual (Mac OSX) also available directly on Torrent Sources.